It's important to remember that the newest, most sophisticated sewing machines available today will not a skilled sewist make. To the sewing industry, we home sewists are seen primarily as consumers. We are encouraged to buy their products and often do, whether we need them or not. If it wasn't suggested to you that your current sewing machine is outdated and inadequate, you would never replace it, provided it was working properly. Sewing machine features must be continually repackaged in new and improved ways. The only innovation happening in the home sewing industry, in my opinion, is the marketing of the same old features! Your actual skills may even be hindered by a more sophisticated machine. Consider that most of the ready-to-wear clothing in your closet was stitched on a fully mechanical straight stitch machine. In the 1950s, a time I consider the heyday of home sewing, the most you could ask for in a machine was a zigzag function that was capable of a few simple embroidery stitches. It was the skill of the sewist, not the number of features on her machine, that made the difference. With today's electronically-controlled everything, one might think that anyone can sew -- or can they? How do the skills of today's sewists compare to those of fifty years ago? I would suggest that on average, our sewing skills are inferior to those of the sewists of yesterday. If you have true sewing skills then you can sew amazing and professional items on an ancient machine purchased for $2 from Goodwill, because in the end no one knows or cares what sewing machine you used when they see your work. When you show off your new home-sewn item to others, they're unlikely to ask how many thousands of stitches your machine is capable of, if it has a needle up/down feature, or automatic tension adjustments. They will be evaluating your taste and creativity, and your fabric and notion choices. They will even be admiring your straight seams. None of those features are listed on the box of today's sophisticated, perhaps overpriced, sewing machines. In closing, let's not allow sewing industry marketing make us lose sight of what's truly important. Machines and tools are a means to an end; they won't drive themselves. It's the skill and creativity of the person that counts most, not the machine. I'm so psyched to see you have a blog. Your posts on PR were so helpful and your jeans & sheet shirts are downright inspiring. I now own a Necchi Julia because of those shirts! I am one of your biggest fans on PR! I'm thrilled to find that you're doing a blog. 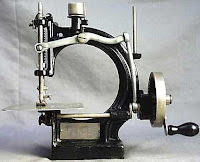 I own several old (all metal) mechanical sewing machines. They're easy to use, easy to maintain and built to last! I don't understand why anyone would ever buy a new machine. That Dressmaker you have pictured is awesome! The dress maker is one of my most favorite vintage machines! There's even a model that's easy to find on ebay with a needle position setting, cream of the crop if you ask me! All of my machines have been craigslist and flea market finds. I haven't been fortunate enough to find any Dressmakers. Do you know when it was made? It looks like it's in great shape. I love the color. I have a sage green & cream White model 1466 that's probably newer than your Dressmaker. It's a basic zig-zag machine with awesome heavy metal gears. If I ever get around to sewing any home decor fabrics - this is the machine I will use. I'd say it's from the late 50's to early 60's but it's hard to date these generic Japanese made machines. This really resonated with me because my grandmother gave me a really old and heavy Singer that I'm pretty sure only straight stitches (I'd have to pull it out to be sure, but it weighs more than I do)! (; I want so badly to start sewing but have been hesitant because I wondered if it was too outdated. I'll never know until I try, and I think it'd be pretty badass to sew on something older than me.